Curtis Fleming knew the Riverbound X-Stream in southwest Virginia held good-sized trout. He just didn’t know they were trophy sized. The crew of "Fly Rod Chronicles" was a bit surprised after plying the private fly fishing waters, catching and releasing what might have been the potential state record rainbow before doing the same with a huge brown. The 10 miles of private water on four different creeks and rivers is exclusive to fly fishermen, who must use barbless hooks and practice catch and release. 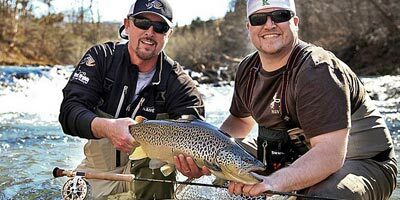 The "Fly Rod Chronicles" airs Tuesdays at 11:30 a.m ET, Fridays at 1 p.m. ET and Saturdays at 6:30 p.m. ET on the Outdoor Channel. Click the image for a photo gallery of the X-Stream fishing.